Update on Thursday, April 19, 2018: Nic Stone is working with her editor on that line. AICL thanks the reader who wrote to us, and, Nic Stone, too, for her understanding! Have you read Nic Stone's Dear Martin? Published in 2017 by Random House, it got favorable reviews, including a starred review from Booklist. 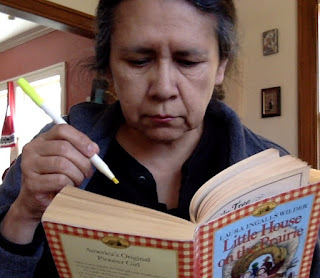 I haven't read it yet, but last week, I got an email from a Native reader who had started reading it. When she got to page 22, she was struck--not in a good way--by a class discussion the characters in the "Societal Evolution" class are having. The main character is Justyce McAllister, a 17 year old senior. He's a scholarship student at Braselton Preparatory Academy in Atlanta, Georgia. He's one of eight black students at the school. Chapter three opens with Justyce walking into Societal Evolution class. The teacher ("Doc") writes "all men are created equal" on the digital chalkboard. He asks the class about the origin of those words. Jared says it is from the Declaration of Independence. Doc: Now, when we use our twenty-first-century minds to examine the quote within its historical context, something about it isn't right. Can you explain what I mean? Doc: Oh, come on, y'all. You don't see anything odd about these guys in particular making a statement about the inherent "equality" of men? SJ: Well, these were the same guys who killed off the indigenous peoples and owned slaves. Justyce: Native Americans or American Indians if you can't name the tribe, homie. Jared: Whatever. Point is, neither were really considered "men." Doc: That's exactly my point, Mr. Christensen. So here's the question: What does the obvious change in the application of this phrase from 1776 to now tell us about how our society has evolved? Jared: Well, for one, people of African descent are obviously included in the application of the quote now. So are "Native American Indians." "Well, these were the same guys who killed off the indigenous peoples and owned slaves." 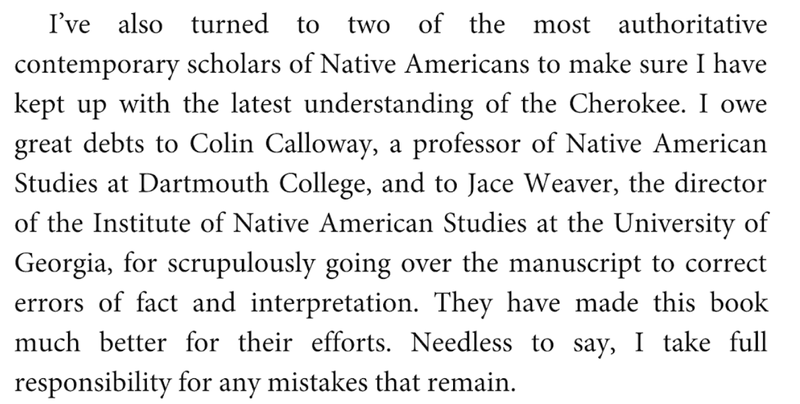 If you're a regular reader of AICL, you likely know why that line is a problem for a Native reader. Today, too many people think that all of us were "killed off" and that we no longer exist. That line reflects that idea--but it isn't true. We're still here. As the conversation continues, Justyce corrects Jared's use of "Indians." That's great! Though I haven't read the book yet, it seems to me that Jared is a character who is meant to signify resistance to social change. That's reflected in the author's use of italics to emphasize Jared's use of "Native American Indians" in his reply to Doc. Several writers have asked their publishers to make small changes to future printings of their books. In particular, those are instances in which an author used "low man on the totem pole" or "spirit animal." Their publishers agreed to their request. Jared's comment that people of African descent and Native peoples are "obviously" included in "all men are created equal" might be how Stone intended for readers to understand that we're still here, but I don't think it is explicit enough to have readers move away from the vanished Indian idea. In that conversation, Justyce corrected Jason. In future printings of Dear Martin, I think Stone could use Justyce to correct what SJ said, too. Or, she could modify what SJ says. What do you think? What kind of edits could be made? To ‘Debbie Reese’ is to read closely & critically, w/ love & deep compassion for your people, w/ a keen understanding of history & power structures & how that affects young readers. Common use: "Yes, but has this galley been #D_Reesed ?" "Yes. Thoroughly #D_REESED." Error: "thoroughly" is redundant here. Again, cool, RIGHT? I was delighted but beneath that delight was a powerful surge of appreciation for the meanings that my work has for Ibi and Rita. I like my name being turned into a verb that has such significance! Debbie--have you seen BLOOD MOON: AN AMERICAN EPIC OF WAR AND SPLENDOR IN THE CHEROKEE NATION by John Sedgwick? Last night (April 16, 2018), Jace Weaver, the director of the Institute of Native American Studies at the University of Georgia, posted a comment about John Sedgwick's Blood Moon to his Facebook page. With his permission, I am quoting parts of it. Dr. Weaver began with this word: "Warning." He then said that the publisher, Simon and Schuster, had asked him and Colin Calloway (a professor of history and Native American Studies at Dartmouth) to vet Blood Moon. It was already typeset in galleys, and, Dr. Weaver said, "it was horrible." It had "numerous factual errors" and "faulty interpretations." It bought into and trafficked in "the worst stereotypes." Both professors provided detailed readers' reports, but Sedgwick (the author) did not correct all the factual errors, and he "did nothing about tone or stereotypes." 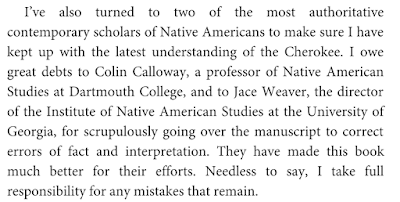 "The worst of it is, we're thanked as 'two of the most authoritative contemporary scholars of Native Americans.' Arg! Avoid this book!" See that? Sedgwick writes that he owes Weaver and Calloway "great debts." I think he owes them an apology. And that last line "I take full responsibility for any mistakes that remain" is Sedgwick's shield. It is a disclaimer that tells us, without telling us, that he ignored some of their input. His use of "mistakes" is also worth thinking about. Factual errors are one thing but the tone that Weaver objected to? That sort of thing can be put forth as point of view. What Weaver and Calloway (and me, below) say is derogatory stereotyping, Sedgwick can say he sees it differently. Someone once told me that what I call a negative stereotype can be seen by someone else as a heroic image. Based on what Weaver said in his Facebook post and what I saw of the book, John Sedgwick's Blood Moon: An American Epic of War and Splendor in the Cherokee Nation is definitely in the Not Recommended category. Because of Simon and Schuster's marketing budget, it is going to be crucial that we use word-of-mouth to let others know there are problems in this book. It should not be used in high school classrooms. Below is my original post, published on April 12, 2018. A reader wrote to ask if I've read John Sedgwick's Blood Moon: An American Epic of War and Splendor in the Cherokee Nation. It isn't for children or young adults, but, the reader notes, some people might get it for a young adult or a young adult collection in a library. I haven't read it. I can make some initial observations, based on how I go about analyzing books. I'm using what I see in the preview from Google Books for some of these observations and I'm using information made available about the book, including the book trailer at the Simon and Schuster website. Let's start with that video. Sedgwick begins with "who knew" in an astonished tone, that Native people fought in the Civil War. Whenever someone uses that "who knew?" phrase that way, we are told a lot about that person. In this case, Sedgwick means that he didn't know, and that people he knows didn't know. From that body of people who did not know, he utters the "who knew" phrase. You know who knew? Cherokees. They know. So do a lot of Native people, including those of us who read beyond the master narratives of history. Then, he talks about how people know about the Trail of Tears, but that they don't know about a disagreement within the Cherokee Nation, about removal. That's what his book is about. First: Is Sedgwick (the author) Cherokee? Answer: No. Does that mean he cannot write this book? Obviously, no. The book is out there, from a major publisher. Does it mean he should not write the book? Again, no. Anyone can write about anything they want to. The significant questions are these: are the contents of the book accurate? Who vetted the book? When/if I get the book, will I find that Sedgwick worked with the Cherokee Nation on this book? Was their feedback used? If their feedback was ignored (that happens in children's lit, for sure), it sure would be good to know, but, that sort of feedback isn't usually provided. Sometimes, it comes out, post-publication. A blood moon is a rare form of lunar eclipse. For the Cherokee, any vanishing from the night sky was troubling, as it threw their cosmos out of order. A blood moon was especially terrifying, since the moon did not disappear, but turned bloodred. Meteorologists now see that a blood moon is actually lit by an unusual sunset glow picked up from the earth's atmosphere as the sunlight brushes past. But the Cherokee considered the sight an ill portent. The moon was red with rage over what lay below. Some will find that note compelling. Obviously, Sedgwick is taken with it. He used it as the title and framework for his book. If I was doing an in-depth analysis, I'd try to find out what his source is. Is there a source for it in the back matter of the book? Maybe. If there is, I'd verify that source, too. There's a whole of of "knowledge" out there that gets put forth as being from this or that unnamed Native person that is actually some of the White Man's Indian imaginings. The note is also one that puts one peoples ways of viewing the world into a framework that casts them as simple, primitive, superstitious, etc. Opposite of them are meteorologists. Science. There's a whole lot of denigration and misrepresentation going on in that sort of binary! While the Indians were skilled as scouts, trackers, horsemen, and sharpshooters, their greatest value may have been their fighting skills. Shaped by a warrior culture, most were used to violence, and they took to battle. Their long black hair spilling out from under their caps, their shoddy uniforms ill-fitting, their faces painted in harsh war colors, they surged into battle with a terrifying cry, equipped not just with army-issue rifles but also with hunting knives, tomahawks, and often, bows and arrows. Even when mounted on horses, they exhibited a deadly aim, and their arrows sank deep, leaving their victims as much astonished as agonized. They'd close fast, whip out a tomahawk to dispatch their man, then pounce on the corpse with a bowie knife to shear off a scalp to lift to the sky in triumph. Sedgwick says they were "shaped by a warrior culture." I think Sedgwick's thinking is shaped by that master narrative and its stereotypes. Shall we count them? A few pages later, I see "Great Spirit" and another problematic binary (would they "run to the wild" or to the "bright promise of industrial civilization"). Having read that much, I have serious doubts about this book. Sounds to me like stereotypes form the foundation of how he's writing. If I get the book and read it, I'll be back with a review. In the meantime, I welcome your thoughts. 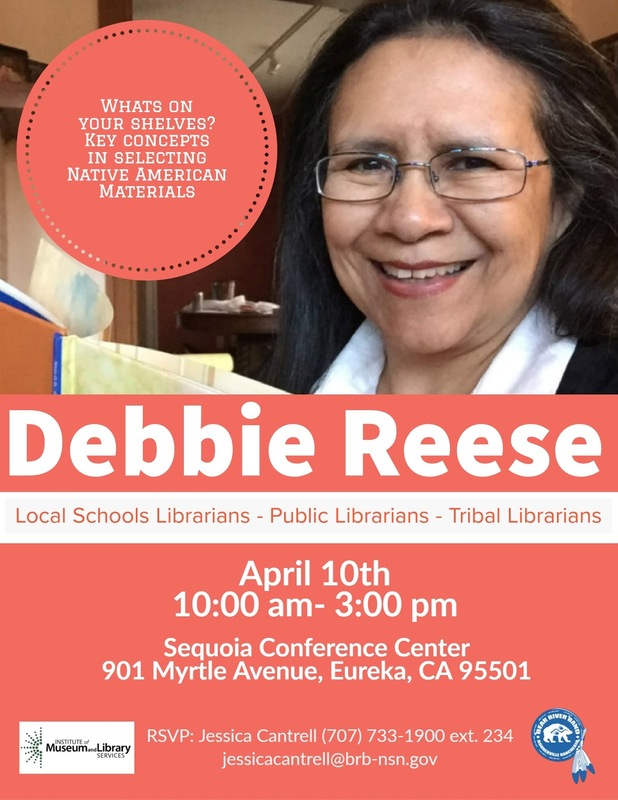 I've been spending the last week days preparing for my visit to Eureka, California, where I'll work with school, public, and tribal librarians on collection development! Hope you can come! Thank you, Jessica, of the Bear River Band of the Rohnerville Rancheria for arranging it, and thanks to the Institute of Museum and Library Services for supporting it!